I’ll definitely keep those in my prayers–those you’ve mentioned and all those that are having a hard time this holiday season. Thanks for the great giveaway. There is nothing better than new Jillibean soup product. Woohoo! Those people will definitely be in my prayers. I am actually leaving right now to go see my grandfather. He had a stroke this morning, so I would appreciate prayers, too. My prayers are going out to all. Thanks for the chance to win some yummy jillibean goodies! Love the sneak peek. merry christmas ya big ‘soup! Thank you for such a grounding post. It’s easy to get caught up in the holidays and forget that there are others that are struggling. I am going to get a Christmas card off in the mail today to that precious boy. May God Bless him! I’ll pop a Christmas card for Nate in the mail this afternoon. May God’s blessings and comfort be with everyone this Christmas. Gotta love omelets and happy hour!!!! Maybe not together tho! LOL!! Good times! Jill, you know I’m a die hard fan, but that sneak peek is more than awesome! I am so giddy with excitement, I can’t wait to see the new lines! Thoughts and prayers going out to your family and friends. I am thinking of all those people who are struggling at Christmas, and about how lucky I am to have my family and my health. the paper is so amazing ! Alright, first things first ~ I would definitely carry that pp around in your pocket if I was you!!!! Gorgeous!!!! Just prayed for your requests. It sounds like you have lots to look forward to! First off, that paper is adorable and I can’t wait to see more. Second of all, I know that this time of year can be so hard for people and my prayers go out to those you mentioned and so many more. I have a friend whose dad is dying from brain cancer and this will be his last Christmas with them. I can’t even imagine…We are all so very blessed. Merry Christmas to you and your family. So awesome that so many people responded! Hi Jill!! as always awesome products!! Havent had much time for scrapping lately but its my New Years resolution!! My prayers go out the all the families in need this Christmas, whether they just need a hug or more. Ours will be a bit difficult with the loss of my Mom but we will get thru it . Kathy and Ron do *make* the best Christmas trees don’t they? TY for the chance for Jillibean things!!! Have a great Holiday!! Love the projects you posted on the Jillibean Soup blog today! Thanks for sharing. Will send out some extra prayers. I put a card in the mail to Nate. Missey’s sister family and Holly’s cousin Nate will be in my prayers. And I love to win the new products from you. Thank you. Thanks for the sneak peek and giveaway. My heart goes out to those having a difficult time, especially during this holiday season. In this time of hustle and bustle, it’s so easy to feel overwelmed with all of the ‘little things’. It’s always sobering to see the issues that other folks are going through. I’ll be sure to keep those folks in my prayers. Have a blessed holiday – Merry Christmas & Happy New Year! Holiday Prayers all around, my friends and I just did a food drive last week and it felt good to do something for some who actually needs it. Thanks for the give away It would be an awesome christmas gift to get my hands on the new release, I love creating with your stuff. Merry Christmas. My thoughts and prayers are with all those mentioned. Wishing you all a Holiday filled with Love. Hi Jill – thank you so much for the wonderful job you’re doing with Jillibean Soup! I love all of your products! Happy Holidays! I hope all the families you mentioned will have a wonderful Christmas – they deserve it!!! I am loving the new paper!!! I can’t wait to see more! Prayers for all those listed. Glad you reminded me of how blessed I am this holiday season. On another note, I LOVE< LOVE that peek of the new line, it is fab!!!! It is too bad that we have to be reminded how we lucky we are sometimes …. thinking of everyone in need of positive thoughts this Holiday Season. Makes me thankful to read your note and see how fortunate I am, in comparison to some others. My thoughts go out to those with health problems, financial worries, job and housing situations. On the lighter side, your sneak peek is charming! It is a very fun paper. Can’t wait to see what else is coming, and I would be delighted to win a prize. Thanks so much for the chance! This is absolutely the cutest piece of paper. I would definitely love to have some of the new product to try out. That is an adorable sneak but most importantly please know your requests for prayer will not go unnoticed. Thank you for all that you do! You realize how lucky you are when you hear stories like those. Jill that sneak looks great and I will defintely be praying! Hope you have a fabulous holiday with your family! Keeping all in my prayers! Have a Merry Christmas! You have such a caring heart Jill. So blessed to have met you. I’m a bird nerd, so I especially love the paper! Merry Christmas! I will be saying a special prayer for those in need! A couple of weeks ago, my family got the news that my Father has Cancer in his back and Small Intestine. Since it’s too much, the only possible hope is a very aggresive treatment. I’ve been walking around like a zombie since this news so my heart really goes out to anyone that I hear is ill or going through difficulty! Thank you for being such a caring person to mention these cases so we can all come together as prayer warriors! Also, I am grateful for the chance to win your generous giveaway. Prayers sent. So rough to hear the hardships people go through in what’s supposed to be a festive time of year. Thanks also for the sneak peek – I’m intrigued, and I know I can’t go wrong with Jillibean products. Great preview… and we’re glad to hear from you. love the preview!!! super cute! Thoughts and prayers going up for those who are missing family members, asking for peace, bounty and blessings to all! I will definitely keep them in my prayers, especially right now. Love the paper-can’t wait to see the rest! I will def be praying for those in need – I am a Breast Cancer survivor so i know how important and helpful prayer is! Would love to win your samples! I love the sneek peak! I just clicked your link from a friend on Life Preserver and ended up on this site. What a blessing to see a site that shares the wonderful scrappy things and also the love of Jesus. I will keep those mentioned above in my prayers. Have a Blessed Christmas! I am addicted to your designs, your paper materials, everything. I hope my prayers go as far as you need them. It’s easy with all the hype on TV to believe that all is well with the world. This holiday season as it should be most of the time, we should all remember to pray for someone who is going thru the most challenging time of their lives. Thanks for the reminders. I will definitely pray for your friends. I come by once in a while to see what is going on. I love scrapping. (Don’t have time to do it often) Can’t wait to see you in April in Michigan. So happy for you, your family and business! Hello from PA! I am really interested in see’n the rest of the line .. I LOVE what I see so far .. and prayers also for the troops my comrads … that are out there all over abroad to include Kuwait, Pakistan, Iraq, Bosnia etc .. this holiday season .. some NEVER hear from family or receive as much as a card ..
Hope you have a good time at the show! I love the new paper and i am already looking forward to see the rest ! Yes Christmas is a time when everyone needs to look over their shoulder to see if theres any one there that needs a helping hand. 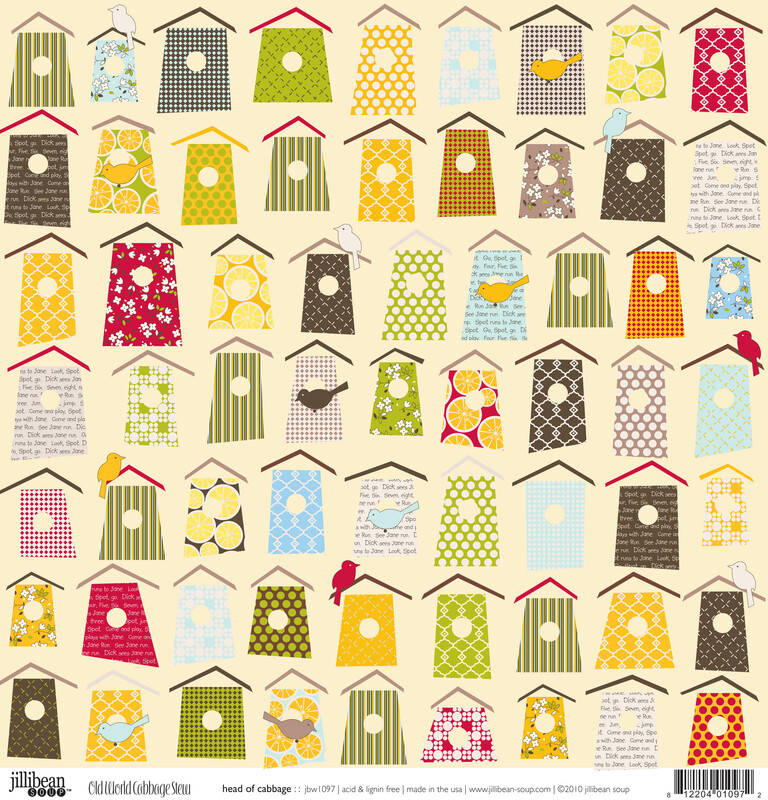 That birdhouse paper is gorgeous. Please enter me in the giveaway! I’ll be praying everyone on your list. Happy holidays! So looking forward to CHA and the new release! That sneak is looking amazing and definitely on my list of must haves!!! You and your family are in my thoughts and prayers!!! My you have a blessed and Merry Christmas!!!! My thoughts and prayer go out to everyone. Really love the sneak and can’t wait to see the whole line. Happy Holidays. I’ll keep all of them (and you and your family) in my thoughts.